One of my favorite quotes include “dress like you’re already famous,” it clearly means that no matter what, you can always always pull off a look that would wow everyone when you step out to attend an occasion. We all are aware of how terribly we love to be in our pjs and sweats, but come on – when you lose that bun and curl those hair you also want a dress that would add a little oomph to your look. High heels, hand bags, belts and all kinds of other accessories are the addition to the stack of your look. Here are 11 looks that you can very easily pull off if you’re heading out for a lunch/dinner with your girls, a family gathering or even a work thing! Ready for my Birthday like #OhYeah ?????????????????? #AboutLastNight wearing #MGT #HotSeller @maheengtaseer ???????????? #AmnaBaber #AmoB @maheentaseer ???????? 1st day of Shaukat Khanum breast cancer awareness campaign 2016 n wearing this beautiful white dress by @crossstitch_official???????? #shaukatkhanum #awarenesscampaign???? #1stday #wearing #crossstitch #white #mayaali???? #dobaraphirse #promotions #ptvmorningshow #nov25th @remashehrbano @remaluxe thank you @mehrukhan thank you girlies ???????????????? 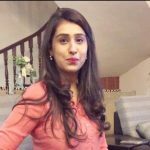 Kinza Piracha is a Lifestyle and Entertainment Editor at ARY Digital Network. Her twitter handle is @PerachaKinza.